For me, preparing and serving food is a sacred ritual. 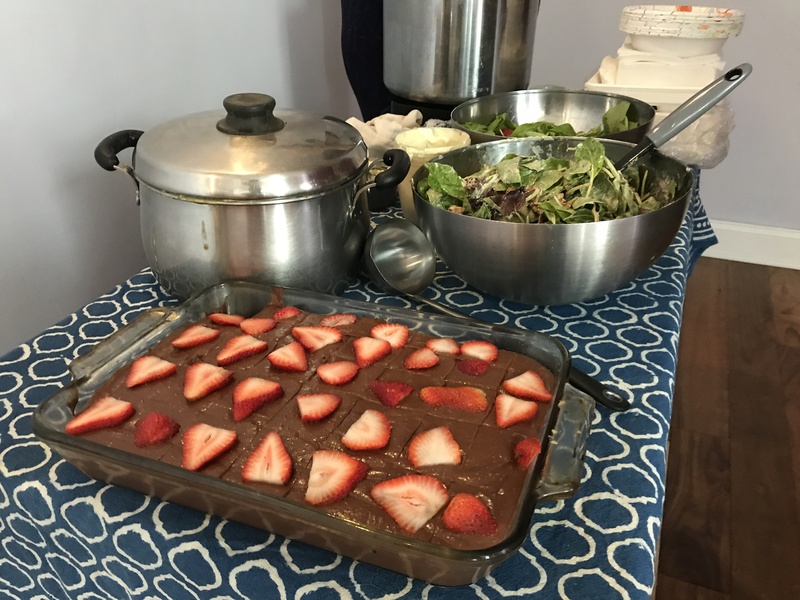 Each month at my Washington yoga studio, Bhakti Yoga DC, we hold a Saturday “yoga lunch,” where we serve a meal to our community. 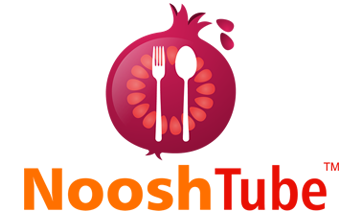 The food is vegetarian, ayurvedic, holistic, and prepared as an offering of love. Every month’s menu is different, drawn from different parts of my experience. I was born into a rich Bhakti Hindu tradition. My mother cooked every day and offered the food she cooked on our altar at home, so it became ‘prasadam’; sanctified and blessed. During the offering process, bells were rung and mantras chanted. As I grew up these impressions were left deep in my heart, and the flavors of the rich spices and herbs stayed on my palate. I was left with a hunger to learn this art for myself. I spent eight years in my 20s living in an ashram, or temple. 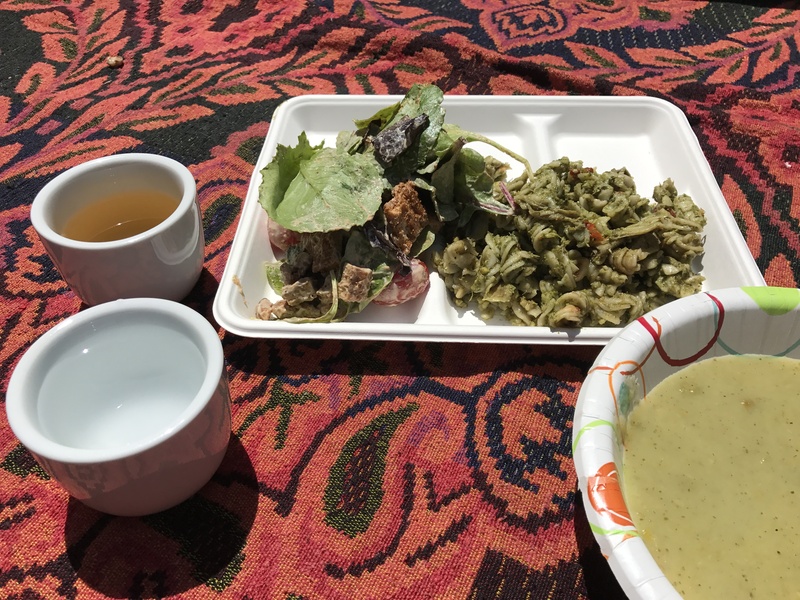 While there, I learned the art of ayurvedic cooking, how to combine spices with vegetables and grains so the result was not only delicious but also suited to the season and health-promoting. I also immersed myself in the sacred rituals that took place on the altar after the food was cooked and before we ate. Every Sunday we would cook a community feast that brought at least 70 souls flooding through the ashram doors. Some ask why we follow a vegetarian diet. The yoga tradition encourages nonviolence and compassion, not just to our fellow friends and family, but spanning all animals. Another term we use in the yoga/Ayurvedic tradition is a sattvic diet – one that is wholesome, life giving, and nourishing. While in the ashram most of what we prepared were Indian dishes. My favorite cookbook was called “Yamuna’s Table,” and I would experiment daily with recipes and flavors from all around India: spicy sweet and sour eggplant, South Indian fried rice, vegetarian koftas (”meatballs”), different types of samosas, homemade cheeses…. After eight years of experimenting and seeing what vegetables, spices and herbs went well together, I was ready to go anywhere and taste other palates and learn from all culinary arts. I married, and moved to America in 2002. Discovering how flavors were different and ingredients more accessible here made cooking even more fun. I believe in eating out only in places where I cannot cook the meal myself. Being a vegetarian can make eating out tricky. But when I try a dish that challenges my kitchen skill, I will often go back to my kitchen and try to recreate it. 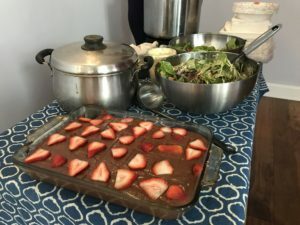 Here’s how our June yoga lunch menu came together: I was in New York at a Ayurvedic vegetarian restaurant my friend started, and indulged in the vegan chocolate mousse. It was heaven on earth – light and fluffy, yet flavorful and completely raw and vegan. My vegan attempts at chocolate mousse have usually used cashews and were very heavy. I asked my friend what she used and she gave me the recipe. The secret ingredient? Irish moss! I followed her recipe to a T – it worked. The pistachio spinach pasta pesto with artichokes and sundried tomatoes was a dish I played around with after my appetite was whetted by another dear friend’s gourmet pesto recipe. And the lemon/lime asparagus soup was my own creation – knowing how good just plain grilled asparagus and lemon taste together, I blended lime zest, a lot of lemon, asparagus and potatoes. Wow, what a treat it turned out to be! Zesty and rich in asparagus flavor. But really it’s not just the recipe. 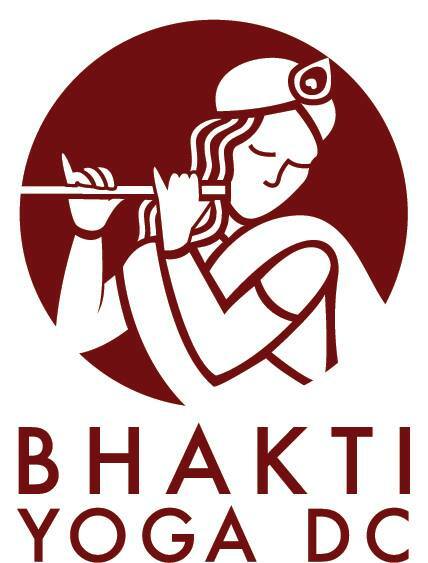 In the Bhakti tradition we believe that consciousness goes into the food at the time of preparing a meal. If I am angry or upset about a situation when I go to cook, sometimes the food comes out too salty or overcooked or something goes wrong. If I am rushed and stressed the food feels lifeless, devoid of the rich flavors that the heart seems to mystically infuse into the food. When I cook for a yoga lunch, first I clean the kitchen spotlessly and take a shower to clear my mind. I usually play uplifting sacred music and chants while I prepare the meal. I think of all the people who may come. Once it is all cooked, I place a serving on a plate, and then offer it on my altar to the forms of God that are represented there. I chant prayers over the food. It is not just asking for a blessing, but making an offering of love to the source and creation. The food then goes back into the pot and the whole meal is transformed into sacred food – prasadam. But food is a process, not a product. I bring all the prepared food to the yoga studio and dish it out to the hungry students who’ve worked up an appetite during the morning’s classes. We sit and chat and make friends and build community in the way that becomes so easy over a good meal. I hope you’ll join us sometime! 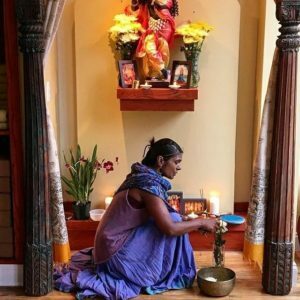 Gopi Kinnicutt is the founder and owner of Bhakti Yoga DC, a yoga studio in the heart of the nation’s capital. 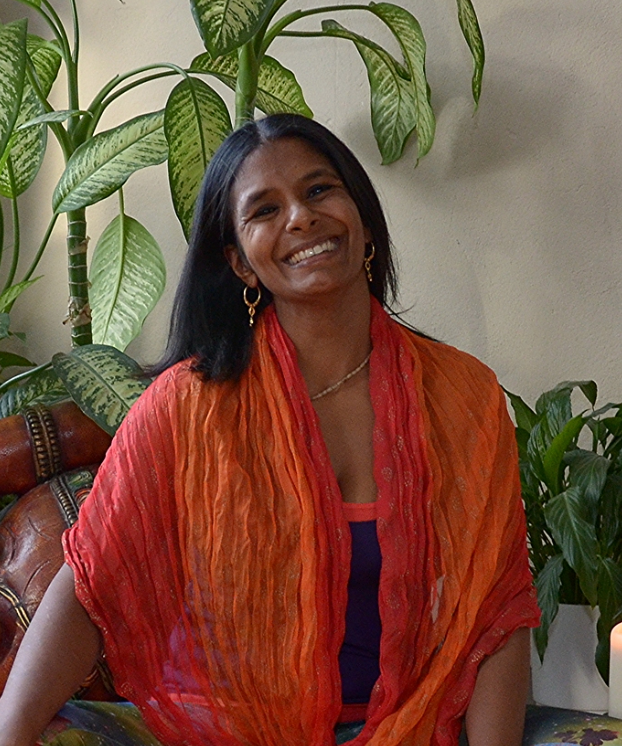 She is known for her dynamic and spiritually-infused teaching style, and is also experienced in therapeutic bodywork and yoga techniques. 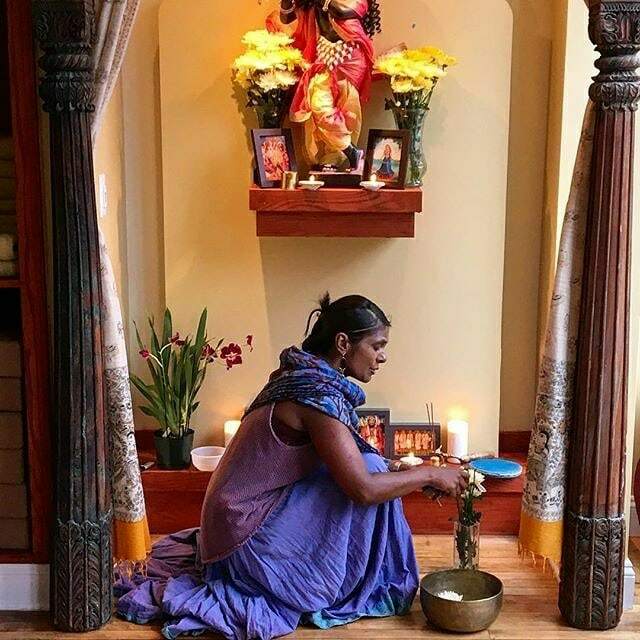 Gopi also lived in a Bhakti Yoga ashram for several years, where she studied and taught philosophy, ritual, Ayurveda, cooking and mantra meditation.